The idea of preserving forests has always made good sense to me, for a long list of reasons. But add to that list, the notion of reducing greenhouse gas emissions, and I had to learn more. That’s why I attended a COP23 session at the US Climate Action Center about carbon sequestration, called The Big Sink: Large-scale Land Management to Meet Climate Goals. An expert panel of representatives from Washington, Oregon, California, the University of Maine, and the World Bank got together to specifically address the successes and challenges of using forests for carbon sequestration. From left to right, Vidar Helgesen (the Norwegian Minister of Climate and the Environment), Chris Davis (Senior Advisor of Energy and Carbon Markets for the Governor of Washington), Ruchi Sadhir (Energy Advisor for the Governor of Oregon), Aaron Strong (Professor of Marine Sciences at the University of Maine), Louis Blumberg (The Nature Conservancy), and a representative from the World Bank. Photo taken by Colby Buehler. The representatives from the three west coast states focused on the challenges of protecting forests through careful planning and limiting of urban sprawl, and by using specific incentives, like the California Cap-and-Trade program and forestry offset initiatives. I was especially interested in Dr. Aaron Strong’s discussion about the University of Maine’s leadership in utilizing their forests for reducing carbon levels and boosting educational opportunities. Dr. Strong started with a description of the University of Maine as a public land grant university and noted that they oversee the protection of 5,500 hectares of forests near campus. These forests play an important role in meeting carbon footprint reduction efforts under the American College & University Presidents’ Climate Commitment (since renamed the Carbon Commitment) because of their value as emissions offsets and carbon sinks. This Carbon Commitment challenges universities to reach net-zero carbon emissions at their campuses by 2050 – several hundred college and university presidents signed on as far back as 2007. Currently, UMaine forests sequester 10,000 tons of carbon per year and eight companies utilize their land through the Californian Cap-and-Trade program. While this represents only a relatively small portion of UMaine’s total carbon footprint, every bit matters to them in order to reach their carbon neutrality goal. While the forests play a key role in helping reach carbon goals for UMaine, they also serve as living laboratories for environmental education and research in fields such as ecology, environmental engineering, and natural resources and the environment. Dr. Strong emphasized the importance of getting students involved in forest research projects. He argued that if students can get outside to experience nature firsthand during their coursework they would be more likely to continue with environmental careers, research and activism after graduation. UMaine continues to actively seek out opportunities to enhance their forest management program and collaborate with other organizations. Recently Dr. Strong assembled a group of higher education institutions and businesses to discuss different ways to enhance climate action initiatives by utilizing forests. We can learn from UMaine’s accomplishments. I would love to see a dialogue between UConn and UMaine to strengthen forest management programs at both institutions. Environmental leadership includes collaborating and exchanging information with your peers for mutual benefit. COP23 and the U.S. Climate Action Center featured many talks by business and governmental leaders that incorporated the role of universities. As a COP23 fellow, I look forward to bringing these discussions back to UConn. UConn COP cohort listening to Nuclear Power discussion. Photo taken by OEP Director, Rich Miller. We started our first full day in Bonn, Germany, visiting the U.S. We Are Still In (WASI) tent. Unfortunately, it turned out the center was closed to the public for a business conference. While our group lingered outside to consider alternative plans for the day, we were invited to view a talk on nuclear energy. Apparently, the presentation group was scheduled to present at the same event we originally planned on attending, but was uninvited at the last minute. Their explanation for the removal was that the U.N. determined nuclear energy should not take part in sustainable energy discussions. The abridged 15-minute presentation was, in a word, interesting. It was one-sided since there was a clear objective to persuade the audience that nuclear energy is an excellent carbon-neutral choice over coal and other fossil fuels. Given that time was limited, details and facts were largely missing and we instead experienced flashy rhetoric. Beyond that, it was fascinating to see how they argued that nuclear is a “sustainable and pragmatic” choice. I am largely uninformed about the pros and cons of nuclear energy but I thought their points had at least superficial merit. Nuclear power can reliably provide the amount of power the world currently uses, while quickly reducing the global harmful emissions that COP23 is intending to eliminate. They stressed that emission reduction goals were not feasible with only conventional alternative energy since it is more expensive and is reliant on unpredictable factors (e.g sun and wind). Furthermore, they criticized Germany for recently investing in brown coal, the most carbon-intensive fossil fuel. In particular, they objected to Germany’s approval of a new strip mining operation on the outskirts of Bonn that had resulted in the evacuation of a small farming village. Obviously, there are valid concerns about radioactive nuclear waste, which the group did not address. But I am still intrigued as to why nuclear power has such a small role in today’s energy discussions. It seems like it should at least be considered at the U.N.’s international climate summit. A highlight of the 15-minute presentation was an opera singer’s rendition of an anti-coal message. For an environmental opera singer (looks like those exist), I enjoyed his voice! His performance might have not persuaded anyone through hard science and statistics, but it did get our group’s attention. On the final day of presentations at the U.S. Climate Action Center, near the official COP23 “Bonn” and “Bula” Zones, our UConn@COP group of students and faculty attended a talk by Todd Stern, Special Envoy for Climate Change in the Obama Administration, and Susan Biniaz, a legal adviser for US climate negotiations. This talk, on the last day of the “We Are Still In” (WASI) events, was interesting to listen to, as it brought the perspective of those who really led the charge of climate negotiations in past years. 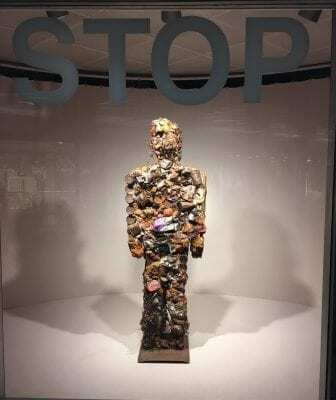 One of the “Trash People” by HA Schult. Photo taken by Mary Donato. One particular quote by Todd Stern stood out to me. In explaining how the United States will move forward in light of the announcement that the federal government intends to pull out of the Paris Agreement, he stated that “politics is the killer.” As soon as he said it, I realized how many of the things I had seen throughout the week proved the statement true. So many people and groups showed up to represent their passion and share their stories and ambitions. Movements from humble beginnings, individuals affected by storms and sea level rise, representatives from companies huge and small, and groups of students, all attended the conference in numbers that reflect the interest and willingness of the people to move forward. The many WASI speakers and panels at the U.S. pavilion were a huge reflection of the intention of subnational entities to move forward with climate action. It was rightfully brought up at the closing panel that this sort of subnational movement is complicated and can become cumbersome. However, it is refreshing to see coalitions like WASI, which includes cities and states, businesses, NGOs and higher education, continue their commitment to climate action, despite political leaders at the federal level. 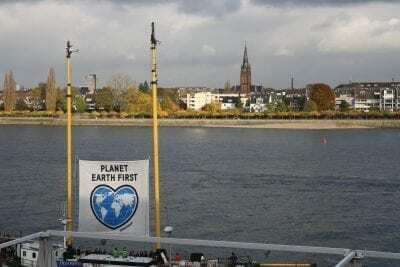 There was no inkling of politics “killing” climate change movements from the hundreds of people representing the coalition who showed up at COP23. Despite any roadblocks politics may present, there is already clear evidence, at the subnational level, of a determination to overcome. Any Conference of the Parties is by nature a political gathering. Despite this fact, Todd Stern made a powerful statement that helped me realize why the WASI movement is so important. He talked about the idea that creating norms is more powerful than creating laws. For example, renewable energy technologies are cheaper and more efficient than ever, and will drive the more widespread use of cleaner energy instead of carbon-intensive fossil fuels. As these and other costs of being environmentally friendly get lower, and as diverse groups become more engaged, so to will climate action become a norm throughout the United States and worldwide. My experience at COP23, as a representative of the WASI coalition, assured me that we have the power to create positive norms for future generations. It’s been a few weeks since I returned from COP23. Even after arriving home and discussing my experience with friends and family, I still have trouble distilling what I learned and the myriad emotions I felt into an ‘elevator speech’ (which, frankly, is all people really want to hear). I feel frustrated that the numerous disciplines studying climate change—from sociology, to political science, to human rights, to chemistry, to engineering, to ecology are ‘silo-ed.’ In my conversations with my peers, I recognized a dissonance between what each of us thought should be prioritized in the fight to mitigate climate change. After attending a panel hosted by the University of Maryland’s School of Public Policy and Tuft’s Fletcher School, called “The Engine of Ambition: University Research and Engagement to Support Climate Action,” I realized this dissonance I felt was not unfounded. While the panel was focused specifically on the research in public policy programs, the message carries over to all researchers and academics: If we are not taking it upon ourselves to make sure that our research is understandable and accessible to the general public and policy makers, what’s the point? This means extra work. Photo taken by Dr. Mark Urban. Obviously, more complex reports are necessary to ensure that our research can be expanded upon by others in our fields. However, the increasing specialization of academics necessitates the production of summary documents, like white papers, that explain research in language understandable to those outside of our fields of expertise. Beyond that, both natural and social scientists are constituents. It seems obvious to me now that we can’t just make our work accessible. As members of a democracy, it is our civic duty to actively bring our research to our policy makers and help them understand its urgency. A quick Google search of the question “what is the responsibility of a politician?” produces countless iterations of the same thing—the responsibility of a politician is to secure and protect our unalienable rights. When it comes down to it, the fight against climate change is the fight for the right to live—a clean and healthy place to live is the foundation upon which all other institutions are built. What is more unalienable than the right to life? 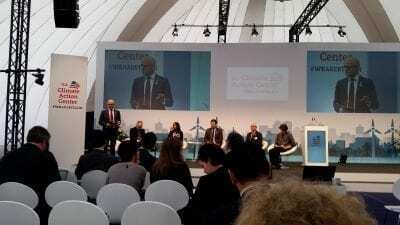 My experience at COP23 left me feeling a lot of things, but most tangibly, I feel motivated. As a political science and human rights student, it’s easy to feel hopeless and dissatisfied. Having the opportunity to collaborate and learn from a group of people whose academic and life experiences are so fundamentally different from mine, reminded me of my purpose, as a minuscule person in a gigantic universe.